Happy Holidays! Have some podfic. 12/26/10 12:38 pm - Happy Holidays! Have some podfic. So. Do ya'll wanna know why I am using this icon? (No, you don't, I know, shut up, I'll tell you anyway.) Because I have shiny Calvin & Hobbes podfic! :D YAAAY! So, first off, some notes about the fic. This was recced to me AGES ago by moonlingmaid (I think). I remember going, "OMG CALVIN AND HOBBES FIC!" and reading it, and then going "...OMG THAT WAS AWESOME GIMME MOARRR!" Unfortunately, there's not a whole lot of Calvin & Hobbes fic out there. The only two that really stuck in my mind happened to be what I sort of think of as mirrors of each other. They're both future fics, they're both Calvin/Susie, Calvin dates Jessica in both. However, tonally, they're totally opposite--I think of them as "the optimistic future one" and "the pessimistic future one". In the optimistic one, Calvin gets put into honor classes and ends up doing well enough in school and life to get work as a graphic designer. In the pessimistic one, he gets put into remedial courses, is the king of detention, and ends up doing manual labor. 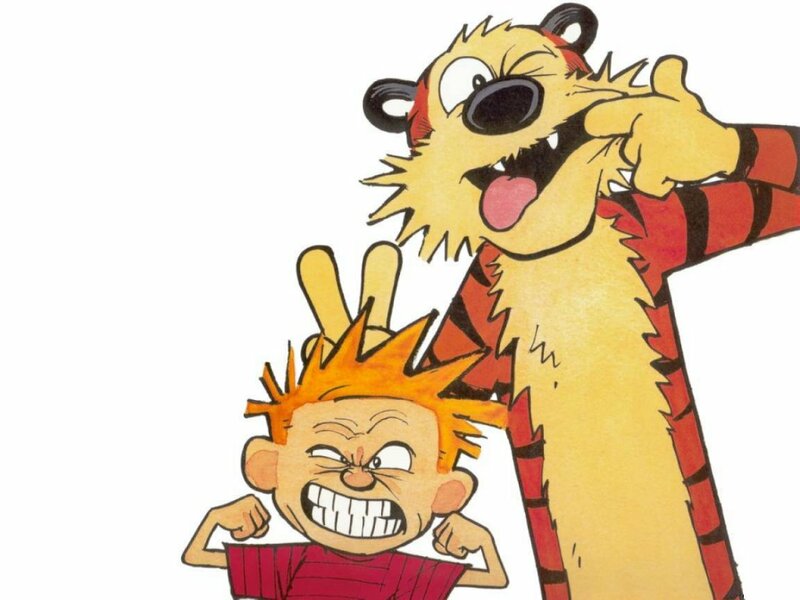 One could actually use the Hobbes in these stories as a sort of metaphor: in the optimistic one, Calvin continues to interact with Hobbes, even into adulthood. In the pessimistic one, Hobbes stopped talking to Calvin, although he can't remember when. And which fic is that, do you ask? Why, Theories About Nuclear Winter, by hollycomb. "You know what I told her about you? What I tell everyone? I've gotten really good at it, do you want to hear? It's a really great story, everyone always laughs. Okay, you be her. Or whoever. Ready? Ask me if I had a boyfriend in high school." "Did you have a boyfriend in high school?" he asks glumly, afraid of the answer. "No, well, kind of." She puts on a fake smile and sits up straighter. "It's actually this kind of hilarious story. I grew up next door to this kid, and I was in love with him, I mean in love, for as long as I could remember. Like, we used to throw snowballs at each other and steal each other's toys, and he was so mean to me but we were always trying to get each other's attention, and then this one day he, like, held my hand on the way home from school when I was crying, and, oh my God, I loved him so much. But he was also this kind of weirdo, like, he was a really bad student, and when we were in high school he started dating this psycho girl and they got, like, arrested for burning down a concession stand together." She stops for a minute, her fake-cheerful voice beginning to strain and her hands clasped tightly in her lap. "This is the part where you laugh and ask me if I'm serious," she says flatly, but then she goes on when Calvin only sits and stares at her. "Anyway, so he's dating this crazy girl, and I'm, like, all heartbroken of course, and so jealous, like, just the sight of her in the halls at school used to make me sweat with rage, I mean, it was ridiculous. So, but, listen, okay, he breaks up with the girl after the whole arrest thing, right? Probably just because his parents made him. And he's all, like, trying to be good, you know, because he's on probation or whatever, so he starts trying to date me. And I'm a total sucker for it – like, this one night he showed up at my window at two in the morning, and I just thought it was the most romantic thing, of course. And I'm imagining that we're going to go to prom together, me and the crazy neighbor boy, like we were destined to be together or something stupid like that, and then, you'll never believe this. His freaking crazy ex-girlfriend set fire to my house! No, I'm not kidding! They, like, locked her up in a mental institution and everything. And the guy, the crazy neighbor boy, he left town. Because he was afraid to get implicated in the investigation of the fire. But no, no, I don't think he had anything to do with it. And no, I don't know whatever happened to him. I never saw him again. So that's my high school boyfriend story." So, you just mentioned that you finished two new podfics, and I figured, "I'll go remind myself what her most recent podfic was," and now, not only am I impressed by your versatility and range, but also my podfic posts feel inferior and sad and possibly in need of emo soap. They are not nearly as intense as this post is - damn, girl! LOL no biggie, I toooooooooooootally know how that goes, aha. It...is kind of unintentionally hilarious, isn't it? Hah. AH! Stop it! Stop it, stop it, stop it. I will get back to you when I have finished cleaning out my inbox. Do not give me new things to respond to! Yes. Yes it is. Plus, the little tally-counter that keeps track of how many unread things I have still waiting is telling me that there's some unread whatever-it-is HIDING in my inbox.